Research has shown that the fenugreek gum powder increases viscosity with increase in temperature. It has also been found to have the “non – Newtonian or sheer thinning” viscosity characteristics. This happens because its chemical structure has a fully substituted backbone, and therefore does not interact well with other hydrocolloids. This unique galactomannan has a mannose backbone grafted with galactose units in an average ratio of 1:1. The purified powder of the powder has very good interfacial activity compared to many other galactomanans. This leads to formation of very good oil in water emulsions with smaller droplet sizes and longer term stability of the molecules. The fenugreek gum powder has been found to adsorb(precipitate) on the oil interface to form a relatively thick interfacial film leading to more stable emulsions than any other films from other galactomanans. The fenugreek gum powder, unlike other types of hydrocolloids, is therefore unique in reducing the surface tension of the fluid. This particular property helps to prevent mixture of fluids against flocculation and coalescence. When this property is combined with the water holding ability of the gum, it has been found that the gum can be used in the manufacturing of cosmetics. 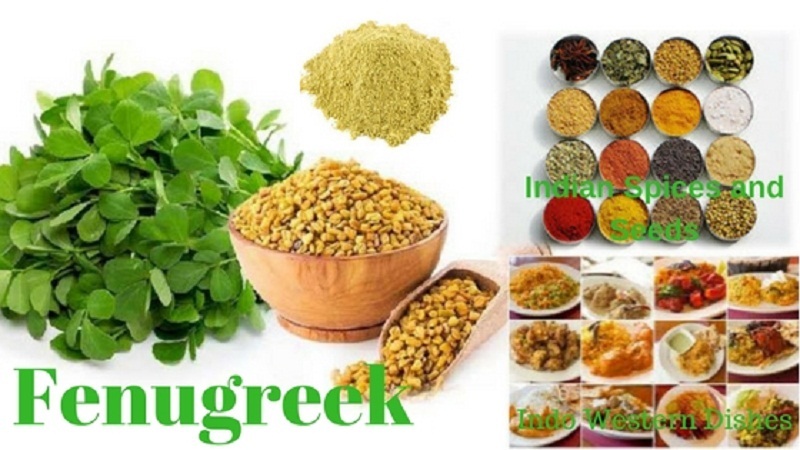 Nutritional value; 100 g of seeds of the fenugreek have been found to provide more than 65% of the dietary fiber due to the high fiber content present in the food. It has been found to have a great ability to change the texture of the foods. In modern food technology, the powder is used as a stabilizer, adhesive and emulsifying agent due to the fibre, protein and gum content. Its protein has been found to be more soluble at alkaline PH of 11. Some of the proteins found in the fenugreek gum powder include the globulin, histidine, albumin and lecithin. In usage, the molecular weight of the fenugreek gum increases with increased gum concentration or reduction in the residual protein attached. The fenugreek gum powder has gained popularity as a hydrocolloid with increasing usage in many industries in the world. Its main uses are in the food industry as a thickening and emulsifying agent. It is also useful as a source of many nutritional elements such as proteins, vitamins and a high source of fiber in the body. It is also used to add aroma to foods due to the presence of various aromatic compounds in their structure. In the last three years, the guar gum has been under pressure from major factors of production and marketing that had a heavy effect on the entire supply chain. These factors included poor production, poor demand and poor crude prices. There has been a good sign of recovery in the period 2016-2017, as there was witnessed an approximately 30% increase in the prices. This trend is expected to continue well into 2018. According to data from several physical markets, the sentiment has been fairly neutral with most markets closing the day at the same prices of guar seed or at slightly lower prices. In the market of hanumangarh for example,there was no absolute change in prices of the guar seed loose by the end of day of January 29th trading. The prices of guar seed in the market of Nohar also remained the same. By the mid of the year 2017, it is estimated that the total cultivated area was in the rain fed zones and the productivity per hectare estimated at 200 kilograms of the powder per hectare. This was considered much lower than expected and also coming from a lower cultivated area as compared to the year 2016. Rajasthan and Gujarat are the two major producers of the guar seed and low planting and production acreage was reported. There was an approximately 10% drop in the production acreage which ultimately translate to reduced supply. It is also noteworthy that the prevailing climatic conditions did not quite favor guar production. It has been noted that areas with irrigated crops have experienced better production and the recorded weight of seed is also very good. This translates to better recovery of the guar splits from the guar seeds. With the perceived reduced production and increasing USA shale gas output, it is expected that there will be a generally positive trend in prices of the product. The decline in the prices towards the end of the year 2017was attributed to higher carry forward stocks by both traders and farmers. There has been rapid recovery in the crude oil prices and advancements in technology used in shale gas production has seen many of the oil rigs come back to full production in the united states and the world. This spells good times for guar gum powder producers in the year 2018 and going forward. The exports of the fast hydrsesation guar gum powder to Norway were also noted to have increased by up to 52 % which is a good indicator of the market direction. There has been a continuous average growth rate in the guar gum powder demand of approximately 8.8% per annum and this trend is bound to continue. Increasing research and development activities has led to more and more applications of the guar gum powder being discovered every day, the future looks good for the guar producers and the value chain will benefit.